A good friend of mine has recently started a new job and she was feeling a bit unsure about it all and told me that her office environment hadn’t turned out to be as friendly as she’d hoped. 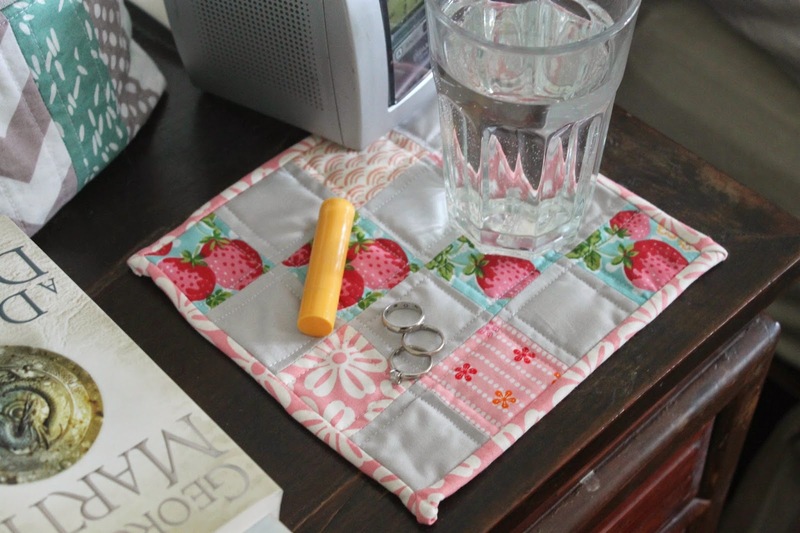 I decided to do something to help make her workplace more inviting, so I made her this little mug rug to go on her desk. I used the Mini Swoon block pattern by Camille Roskelly. I love her designs and all her quilts and fabric choices are consistently beautiful. In many Swoon blocks I’ve seen (do a pinterest search on Swoon quilts – there are LOADS), white is the most popular background so I decided to change it up and use an aqua solid. I had a bit of trouble making this – it was my first time using the pattern. It’s much more detailed than any block pattern I’ve sewn before and on such a small scale it’s quite fiddly. I thought I’d made a bit of a mess of it once all the block elements were done, but spending some quality time with the seam ripper and trimming it up before sewing the block elements together salvaged it. The feathers print is a recent purchase from my local Spotlight and the grey spot I bought online a few months back. I can never have too many polka dots! The finished block is about 8″ square but I added a small border before I quilted and bound it, so the finished mug rug is probably about 9″. 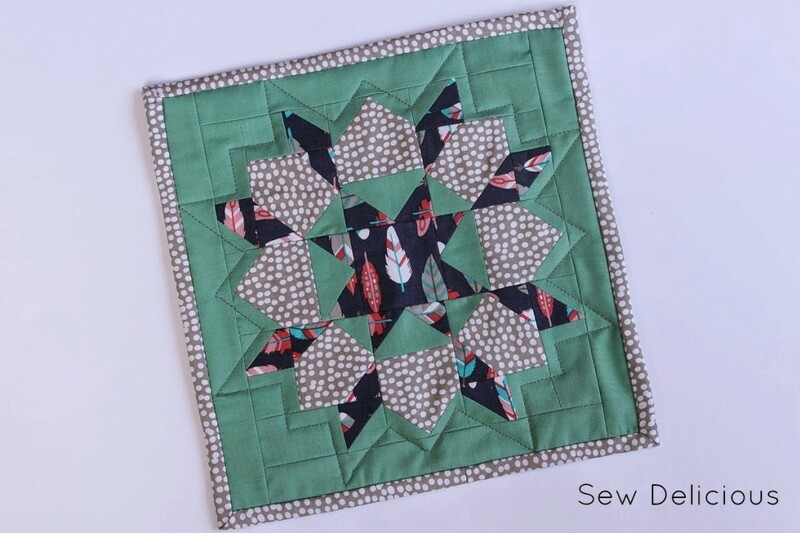 The quilting is minimal, just an outline around the star shape. I’m kinda late to the party with the Swoon pattern, it’s been popular for a few years now. That’s fine – let’s just call me fashionably late! 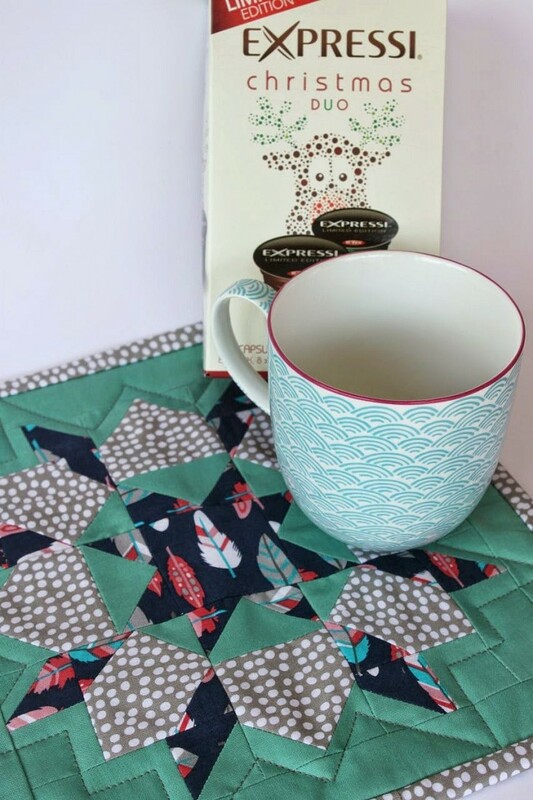 It’s good to get a pattern after it’s well established, because I like to search around the internet and look at the different variations other quilters have made. 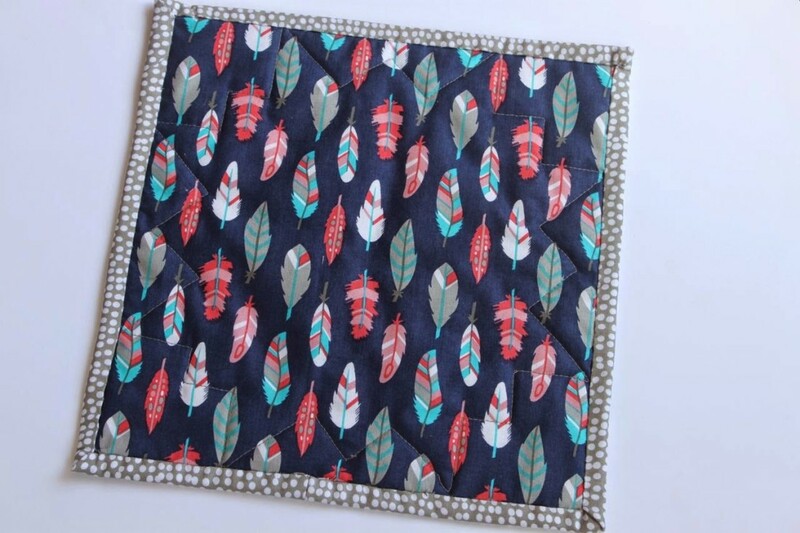 It allows me to pick my fabric combo more carefully and identify things I like or things I would change. I also bought a pretty mug and I remembered a conversation where she mentioned that her office has an Aldi coffee machine, so I picked up a pack of coffee pods for her as well. 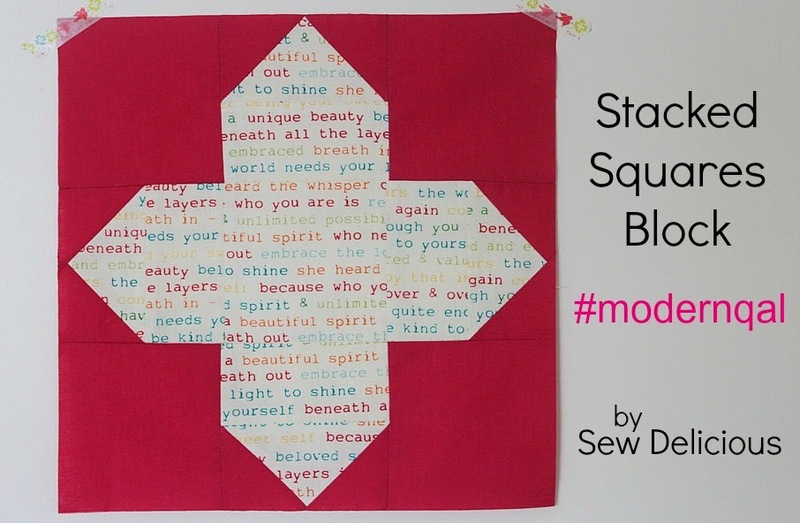 I’d love to make a whole quilt from these mini swoon blocks. They are just so pretty. I also purchased the original quilt pattern, the blocks are much larger, so maybe I’ll start there and see how I go. I’ve made several mug rugs in this past month – I’ll share another with you in the next post. I do love the quick finish and the possibilities are endless design wise. 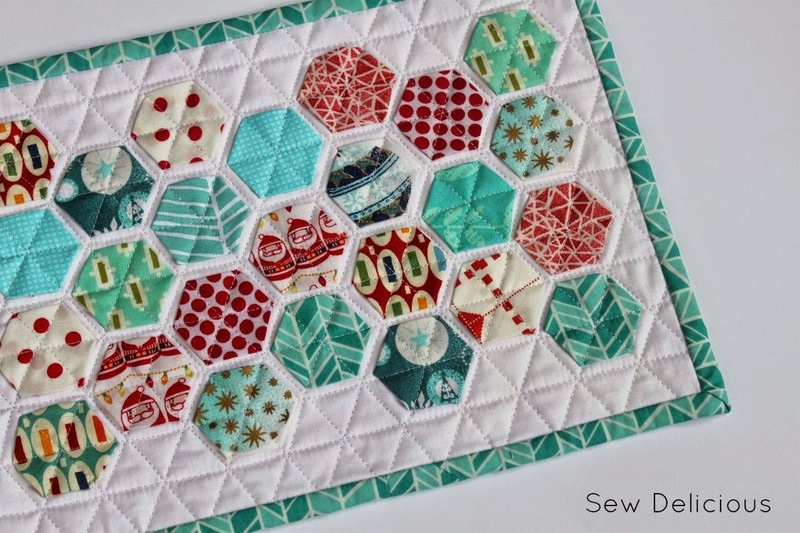 Quick quilty goodness! What a great pressie! I am sure this mug rug will cheer your friend up! it might become the best conversation starter! Lots of small pieces in the block, Ros. 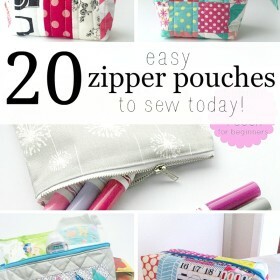 I'm sure I'd need my seam ripper too. A lovely mug rug and very thoughtful of you. How cute!! She will look at that and think of you and smile!! Love the mug rug (it's fun to say, too, no?! Mug rug!! ), but most of all I just adore the care & thought you put into it all. Not unexpected from reading your blog, but just so freaking nice. Santa seriously needs to step up his game for you this year.